We all have our favorite characters. Whether it be from our favorite book, show or pop culture, there is an icon that we can't live without. Have you been looking for your favorite character? Here are some of the most searched for images on the internet. These are all licensed for reproduction. There are some patterns out there that are not licensed. Please be careful of these patterns! It is definitely a good thing to give credit and to play by the rules as far as copyright goes. The stars of this 8-page fold-out leaflet are Good Luck Bear, Secret Bear, Daydream Bear, and Funshine Bear. This is a fun pattern to use on baby clothes, quilts, or bags. Have fun with this retro pattern. Create a cute and unique gift for a new baby with these Care Bear Designs from Leisure Arts which are accompanied by how-to instructions for several projects. You can use these patterns to create fun retro style keepsakes. 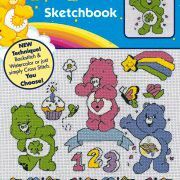 Leisure Arts Care Bears Friends in Cross Stitch has five large patterns that are sure to please fans of any age. 123 Stitch offers a plethora of Disney-themed kits and patterns. Find everything from Pooh to the Princesses. You may even find a High School Musical kit or two! This is a must have for any Disney fan. You can stitch these patterns on just about anything from clothing to household furniture. Add your favorite Disney quote to the character for a one of a kind project. With a little practice, this quick to stitch project will result in a work of art featuring Eeyore, the lovable little donkey from Disney. Kits with Winnie the Pooh, Eeyore, Tigger, Tinker Bell, and many other Disney characters from small projects to large. Cute kit with the star of Disney/Pixar film Cars. This pattern is fun for children of all ages. If you have a car lover in your life, stitch up this Cars inspired pattern for them. It would go great on a jacket. Patterns based on children's books are fun and a great way to celebrate children reading. You can use these patterns for bookmarks for their favorite books. Check out the fictional characters like Angelina Ballerina, Madeleine and Babar come to life in Cross Stitch. Thomas the Tank Engine is a beloved show on PBS. His adventures are fun for children of a younger age, but adults have fun with it too. These patterns would be fabulous on a child's quilt or hung on the wall. Why not stitch it up on a pair of overalls. Various designs based on the popular children's show. This is also a fun pattern for fans for trains. You can alter the pattern for a one-of-a-kind project for the train fan. Tow Mater is a favorite of so many people. This kit will make great decorations for your child's room or give as a gift. You can stitch this up for a quilt, in a hoop or on clothing. Look for other Cars cross stitch patterns and create an entire hoopla wall.